Black Hole is one of the few games released by ParaGraph, one of the leaders in virtual reality/3D technologies. Designed by company founders George Pachikov, the game is a fun arcade/puzzle game that plays like a cross between Marble Madness and Deflektor: your objective is to place mirrors to make balls of the same color bump into each other to clear each level. 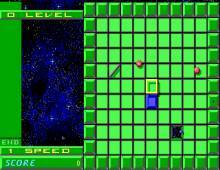 Like many Russian classics like Tetris, Black Hole is fast, fun, unique, and requires both reflexes and quick thinking to succeed. It may not look like much, but spend a few minutes with the game, and you might just find it an enjoyable, unassuming little gem that not many people know about. Two thumbs up!